Fujifilm’s latest gadget is a 3D-capable digital camera with two separated lenses that make it look like a cross between a hammerhead shark and Wall•E. Dubbed the FinePix REAL 3D W3 (almost a tongue twister) this lightweight pocket camera shoots high-rez 3D stills or 720p video to two 10 Mega-Pixel internal CCDs. The FinePix features dual FUJINON 3x optical zoom lenses (35-105mm) to create the 3D effect. The lenses are spaced 75 mm apart, appropriately, to simulate what the human eye sees. The camera’s Real Photo (RP) Processor merges both images into a single 3D image, and stores them to SD/SDHC memory cards. 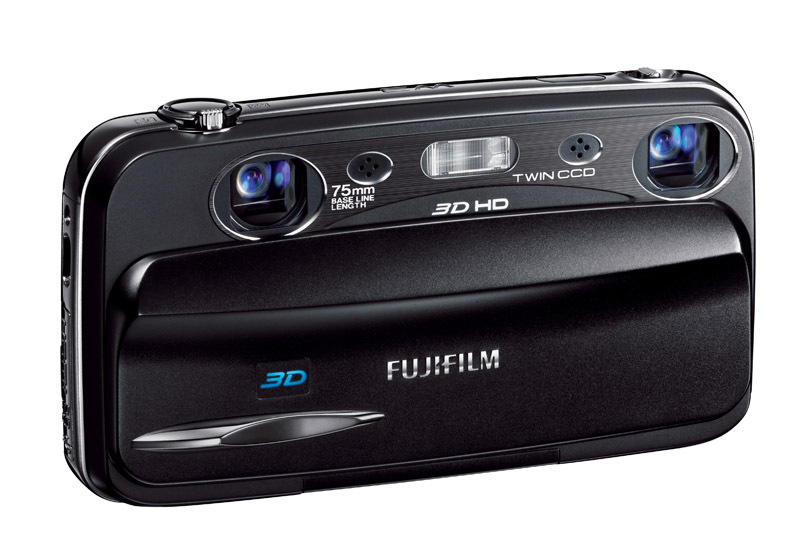 For playback the FinePix’s 3.5″ 1150k lenticular display gives a 3D effect without the need for glasses. For larger output, the Mini HDMI 1.4 port will allow you to display the images and video footage on your HDTV. If you want to get a print-out of your 3D images, Fujifilm has launched SeeHere.com which will give you precision 5”x7” lenticular prints for $6.99. The Fujifilm FinePix Real 3D is available for pre-order at $499 (List: $599) and will ship early September, 2010.